New Rochelle, NY, September 19, 2018– Recently, the U.S. National Institutes of Health (NIH) and Food and Drug Administration (FDA) called for the eliminating involvement of the Recombinant DNA Advisory Committee (RAC) in human gene therapy experiments, marking the end of an era of federal government oversight. While the RAC played an essential role in helping human gene therapy research evolve to where it is today, James M. Wilson, MD, PhD, Editor, Human Gene Therapy Clinical Development, believes this is the right moment for it to exit the stage, as he explains in his Editorial "The RAC Retires After a Job Well Done," Human Gene Therapy Clinical Development, a peer-reviewed journal from Mary Ann Liebert, Inc., publishers. 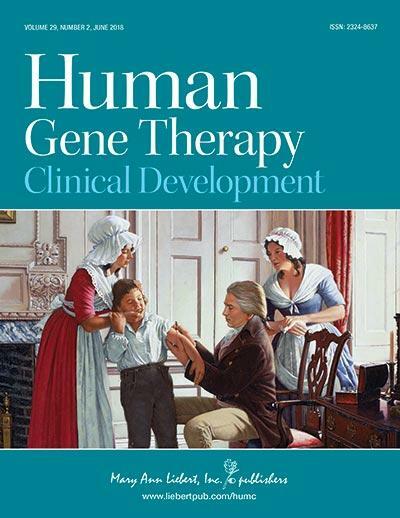 Click here to read the full-text article free on the Human Gene Therapy Clinical Development website through October 19, 2018. "The 2018 proposal…is to completely eliminate the RAC's role in reviewing or monitor-ing human gene therapy studies," says Dr. Wilson. "The new recommendations retain the role of local Institutional Biosafety Committees in the review process, while limiting their evaluation to an assessment of biosafety risks."